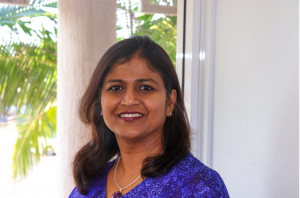 Angela Anthonysamy is a Clinical Psychologist with over 17 years of experience. She is passionate about her work with clients and regarded as a highly experienced therapist in her field. Although Angela has chosen to work currently in the area of adult mental health, she draws expertise from her years of working in a number of clinical areas. She worked as a Parent Child Interaction (PCIT) therapist at Griffith University working closely with parents and families at risk of child abuse. She then worked with Lifeline Community Care Gold Coast in the area of child sexual abuse and acute trauma with children and adults. She also worked in a similar role at the Institute for Infant and Preschool Mental Health in New Jersey with high-risk families working extensively with mothers with postnatal depression and struggling with parenting issues due to their own history of early childhood of complex trauma. Angela is highly regarded and a skilled therapist in the field of PTSD, acute trauma, complex trauma, chronic depression and anxiety for adults who had experienced childhood abuse and other traumatic events. She has extensive experience and expertise working with adult survivors of childhood sexual abuse. Angela is an accredited Eye Movement Desensitisation and Reprocessing (EMDR) therapist and attended the Sensorimotor Psychotherapy training which includes in-depth knowledge and practical training in Affect Dysregulation, Survival Defenses and working with Traumatic Memory. Angela continues to train and keep up with updated training in the field of Post Traumatic Stress Disorder. Angela has a keen interest in the area of neurobiology/brain science and mindfulness practice that she brings to her work as a therapist. She also has a strong understanding in cross-cultural counselling having lived in many different countries and is very accomodative of individuals from different cultural and religious backgrounds. She migrated to Australia as an adult and speaks Malay and Tamil. Angela Anthonysamy offers Cognitive Behavioural Therapy, EMDR, Somatic based therapies, mindfulness and Psychodynamic Approaches. Her approach to therapy is eclectic and client centred, focusing on helping clients understand the self in finding a solution to their mental health struggles.